After spending only 10 minutes using our inversion table you may already feel the healing effects this machine can offer you. As your spine is being stretched your back pain will melt away leaving you feeling rejuvenated and ready to face the day ahead. Our inversion tables also help stimulate blood circulation, assisting in relieving stiff, fatigued and painful muscles commonly associated with stress and other health problems. 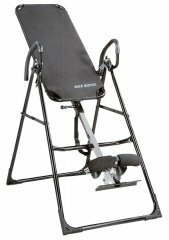 Using our inversion table you may even assist in slowing the aging process as your own body's natural healing process is stimulated by the increased supply of oxygen to your head. For over 40 years, inversion therapy has been a proven technique used for decompressing the spine by chiropractors around the globe. The relief from inversion therapy comes to you in a completely non-invasive and natural way. The stretching of your back gently increases the space between spinal discs, allowing them to find their proper place. Coupled with the increased level of circulation in your body, you will feel reduced pressure on the nerves; meaning less pain. If used regularly before bed, the stretching effect on the spine followed by at least 6-8 hours sleep on a well supported mattress will leave you feeling great. You will have given your body a chance to repair the damage caused by the stress of day to day life. From only $419 our inversion tables are a fantastic way to give you the care your need and the relief you deserve. For more information please don't hesitate to contact us via email (info@primealternatives.com.au) or phone (9558-0008). Disclaimer: We strongly recommends that you consult a physician before beginning any exercise program. We are not a licensed medical care provider. Buyers should understand that participating in any exercise program can result in physical injury and agrees to do so at his own risk. Inversion therapy can provide many benefits to your health. Inversion can relieve back pain, decompress the spine, stretch muscles and ligaments, relieve stress, improve circulation and help maintain overall good health. However, inversion is not for everyone, it is recommended that you consult with your licensed physician before starting any inverting movements. Improper assembly and usage of the fitness equipment can be dangerous and result in serious injury or death. By buying this product you agree that all its related parties are excluded from all and any liability whatsoever for any injuries or damages caused by this fitness equipment.